Former Indonesian dictator Suharto was hospitalized with anemia and intestinal swelling Friday after being treated at home for several days, doctors said. Suharto's condition was not considered life-threatening, but he would spend at least one night under observation, said Dr. Brig. Gen. Marjo Subiandono, the head of the country's presidential medical team. The 86-year-old, who brutally ruled Indonesia for more than three decades until being toppled by a pro-democracy uprising in 1998, has been in and out of the hospital in recent years for strokes and intestinal bleeding. He is said to have suffered permanent brain damage and some speech loss from the ailments. Pertamina Hospital spokesman Dr. Joko Sanjoto told reporters tests were being carried out to determine why Suharto was suffering from anemia, or low hemoglobin levels, and intestinal edema, a swelling of the intestines caused by a buildup of fluids. The former strongman was stable and conscious, he said, adding that he was admitted "because we are concerned." His feet and other parts of his body were also experiencing some swelling, said Dr. Joko Raharjo, a member of Suharto's medical team at the hospital. 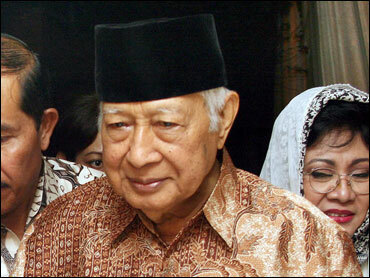 Suharto lives a secluded life in a mansion on a leafy lane in Jakarta and is rarely seen in public. During recent Islamic holidays, he received a stream of high-profile guests and gave a rare media interview in November after winning a defamation lawsuit against Time magazine. Two years after his ouster, Suharto was indicted for allegedly embezzling $600 million, but legal proceedings were suspended due to his poor health.